Fruit flies. Not as cool as seals and birds, let’s just get that straight. But aerodynamically? Fascinating. Joshua Brandt, a PhD candidate at UNSW Australia, and Dr. Naomi Tsafnat, also at UNSW Australia, collaborated with FLIP leader Dr. Graham Doig to undertake a micro-CT scan of the fly’s wings and turn it into a high-fidelity CFD model, so that we could study the effect of wing corrugations that are normally totally simplified out of models looking at these ultra-low-Reynolds number flyers. Since we can’t easily throw a fruit fly in a wind tunnel and expect to measure anything meaningful, CFD simulations can tell us a lot. Here’s the full abstract, and the paper is free to view and download here. The aerodynamic features of a bio-realistic 3D fruit fly wing in steady state (snapshot) flight conditions were analyzed numerically. The wing geometry was created from high resolution micro-computed tomography (micro-CT) of the fruit fly Drosophila virilis. Computational fluid dynamics (CFD) analyses of the wing were conducted at ultra-low Reynolds numbers ranging from 71 to 200, and at angles of attack ranging from -10° to +30°. It was found that in the 3D bio-realistc model, the corrugations of the wing created localized circulation regions in the flow field, most notably at higher angles of attack near the wing tip. Analyses of a simplified flat wing geometry showed higher lift to drag performance values for any given angle of attack at these Reynolds numbers, though very similar performance is noted at -10°. Results have indicated that the simplified flat wing can successfully be used to approximate high-level properties such as aerodynamic coefficients and overall performance trends as well as large flow-field structures. However, local pressure peaks and near-wing flow features induced by the corrugations are unable to be replicated by the simple wing. We there-fore recommend that accurate 3D bio-realistic geometries be used when modelling insect wings where such information is useful. FLIP PhD candidate James Keogh (based at UNSW Australia) recently published his paper “The influence of cornering on the vortical wake structures of an inverted wing” in the IMechE Journal of Automobile Engineering. It’s part of James’ ongoing work into cornering aerodynamics - a condition that is particularly important for racing cars, but is also influential for normal car handling and fuel efficiency. Paper Summary: The aerodynamic performance of inverted wings on racing-car configurations is most critical when cornering; however, current wind tunnel techniques are generally limited to the straight-line condition. The true cornering condition introduces complexity because of the curvature of the freestream flow. This results in an increase in the tangential velocity with increasing distance from the instantaneous centre of rotation and causes the front wing to be placed at a yaw angle. Numerical simulations were used to consider an 80% scale front wing when steady-state cornering with radii ranging from 60 m to 7.5 m, and yaw angles ranging from 1.25° to 10°. The changes to the pressure distribution near the endplates caused the wake structure to become highly asymmetric. Both the primary longitudinal vortices and the secondary longitudinal vortices differed in strength, and the vortex core positions shifted in the vertical direction and the spanwise direction. The change in the position became more substantial further downstream as the structures tended toward the freestream direction. The effects on the wing surface pressure distribution resulted in the introduction of yawing and rolling moments, as well as a side force and an increase in drag. 1st of May in the Cal Poly Low Speed Wind Tunnel. Daniel Henry and Danny Stalters were gluing the foam tail cone for the fan together… next up, composites! The moving ground has been shifted down to the back yard of the lab, next for Andrew Furmidge will be to see how it all fits together. Roberto Rosila-Mares is working up laser safety paperwork (while Elmer from facilities repaints the fan section! ), and a full-span NACA4412 is in the test section this week for AERO307 students to measure the pressure distribution. FLIP PhD student Kyll Schomberg’s article “Analysis of a Low-angle Annular Expander Nozzle” was published in Shock and Vibration (dx.doi.org/10.1155/2015/675861), you can read online, no subscription required. Friday 13th at Cal Poly Low Speed Wind Tunnel. Nothing horrifying happened… yet… apart from for those who had finals this week. Matt Paul working on calibrating the angle of incidence from labview with Dana Clarke verifying values using a digital inclinometer. Our cylinder is in place for AERO307 Experimental Aerodynamics next quarter, rough vs. smooth side, which keeps flow attached for longer? And a curious little winglet item from the model archives… looks suspiciously like a precursor to the split-scimitar that’s coming into service, and very much along the lines of the intricate, high-performing wing additions that birds have been rocking for millennia. FLIP was at the Cal Poly Biomimicry Club seminar on 27th Feb.
Dr. Doig presented research on seal flippers and bird feathers. For more FLIP and older news, hit up our Tumblr! How do you wind tunnel test a supersonic car? I thought I’d make a post about this since I saw recently that a research team in Japan had decided to stick a couple of die-cast models of the Bloodhound SSC “1000mph” car in a wind tunnel and use schlieren visualization to see the shock waves that might be produced when the car runs at speed in South Africa next year. The image above was tweeted by Bloodhound’s Computational Fluid Dynamics (CFD) guru, Ben Evans. The wind tunnel tests came as a surprise to Ben and the Bloodhound team, who have been doing years of numerical simulations on their design to refine and refine it so that it neither takes off nor drives into the ground at ridiculous speeds, rendering driver Andy Green no more. Bit of responsibility there. So why did the UK-based Bloodhound team use only simulation instead of a wind tunnel to develop the aerodynamic shape of their car, and why are there two models in the wind tunnel, one upside down?? First let’s think about wind tunnels for aircraft - they work on the handy principle that it’s only the relative speed of air over the object that matters. Therefore, whether the aircraft is moving through the air (like they’re designed to do), or whether the aircraft sits still and the air moves over it at that speed (as in a wind tunnel), the forces the aircraft experiences - like lift, and drag - are the same, provided everything else is the same. Unfortunately it’s hard to get everything else the same, as having a wind tunnel big enough to hold a full aircraft is just prohibitively expensive and power-hungry and mental. They are not common, and that’s an understatement. So most wind tunnels are fairly small and make use of scale models, like the NASA picture below - the effects of that are another story for another day. When an object is close to the ground, like a racing car or an aircraft taking off, we say it’s in “ground effect”, as the air gets squeezed underneath and creates a different pressure than would exist if that car was up on stilts or the aircraft was at altitude - different pressure means different lift (or different downforce if you like your racing cars), so it needs to be researched properly during any design phase. 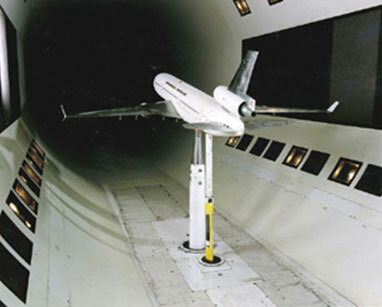 In order to maintain the same principle described above for wind tunnels, the tunnel would need to have a moving floor going at the speed of the air coming at the car or aircraft. A rolling road is common for things like F1 car testing (like in the picture from Sauber F1 below), but they are big and expensive and much more than just a fancy treadmill. They are required so that the air close to the bottom of the wind tunnel - the slower-moving boundary layer - doesn’t build up and give you phoney airflow underneath where in real life there is more room for the air to move. We’re getting one at Cal Poly! You can read a bit about that here. So let’s get back to a supersonic car. If you have a good idea for how to make a rolling road going faster than the speed of sound, great!!! The closest alternative is to fire a model along a track on a rocket sled, almost like a bullet from a gun, but facilities like this are expensive, usually on military land, and things can go wrong in spectacular ways at that speed with those forces (as Bloodhound’s predecessor team, Thrust SSC, found out in the 1990’s with their model breaking apart). When I was researching my PhD thesis on transonic and supersonic ground effect aerodynamics for ground vehicles, projectiles and aircraft, I had to come up with a cheap but accurate way to test in a wind tunnel in order to validate computational models - CFD is great but if you can’t say for sure whether it’s correct, you just have a bunch of nice pictures. I ended up going back to a technique originally used for aircraft back in the 1920’s - the symmetry, or mirror image method - and adapting it to this unusual supersonic ground effect flow regime. It involves two models, one inverted to create that mirror image - you eliminate the chance of a ground boundary layer by having an “imaginary” ground plane, where the symmetry plane is, instead of any physical barrier to represent the ground. It’s not perfect, but it’s extremely close to the “real life” case of having a moving ground, and actually works better at supersonic Mach numbers than at lower speeds. I used models like simple wedges and projectiles – check out a picture of one of my tests below, this one at Mach 2… looks like a 1980’s Atari version of Bloodhound SSC, but it confirmed the symmetry method hypothesis. So! To cut to the chase, the researchers in Japan are using the symmetry method to see what the shock waves look like around the Bloodhound SSC car, and I’m sure the Bloodhound CFD team will be very interested to see how their models match up. Only problem…. can you spot the difference between top and bottom shock patterns? Yep, they’re not quite symmetric… in fact model alignment is really difficult but very critical for this application… even 1 degree can make a big difference. The shock waves reflecting between the car and the imaginary ground indicate sudden pressure changes that they’re working hard to mitigate so that car doesn’t fly or dig; it has to be a perfect balance. So whether the new tests are truly useful or not will be up to the researchers to discover soon, but I’m really pleased to see my techniques recreated for the land speed record attempt - here’s hoping for a safe and insanely fast next couple of years for them! If you want to know more about high speed ground effect aerodynamics including for land speed record cars, check out my big review paper here which was published in Progress in Aerospace Sciences in 2014. The FLIP blog is now live here on the site as well as on tumblr - you’ll find all the older posts still archived there, but from now on both sites will be updated simultaneously. The tumblr blog has some interesting re-blogs and additional picture posts, so check it out if you just can’t get your fill here!